Every kitchen needs a focal point, and that point normally is the countertop area. Granite has been a long-time favorite in upscale kitchens. 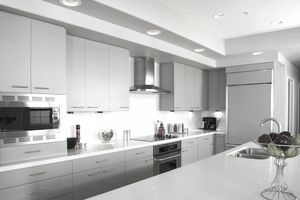 New materials, however, are being used on kitchen countertops combining floor, wall decoration, and appliances as part of the upscale solution to trendy kitchens. Glass countertops are actually one of the hottest trends in kitchen designs. Tempered glass countertops offer a sophisticated look that is very easy to clean while providing a durable surface available in a wide variety of colors. Among the benefits included is that the glass can be made of recycled glass, scratch, stain and heat resistant. Countertops can be made of different combinations and nanotech materials are here to stay. These type of materials can offer a hygienic and safe surface that prevents dirt, germs, and oils from accumulating. The material can also self-heal when heat or friction is applied over it. Wood countertop will add warmth and style to your kitchen. One of the most important trends is to combine the countertop with the cabinetry creating a minimalist and warm look. It can also be combined almost with any other material. Wood can be treated so it becomes waterproof, heat and stain proof providing a very durable and natural surface. It is available in many different colors, shapes, species and is also a natural product. Ceramic countertops are one of the most durable and hard surfaces for kitchen countertops as they are scratch-resistant, very easy to clean while providing a cool surface. It is also heat resistant and is available in different thickness. There are always the traditional yet elegant granite, quartz and composite materials that can be used as best kitchen countertops. Neutral colors are still very popular and will always be. Black and white kitchens are always eye-appealing so make sure to combine them with the right countertop. Add color to your kitchen by combining a backsplash, painted cabinet doors, appliances and other small appliance that can be installed as part of your kitchen cabinetry.